Busselton BEACH FRONTAccommodation - The perfect Holiday Destination. Delightful - 4 x 2 bedroom beach house on half an acre. 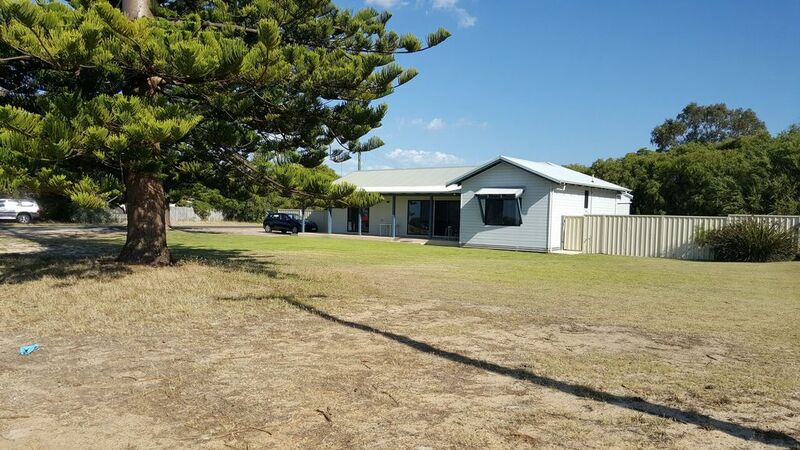 Relax out the front, have a BBQ & enjoy the views of the famous Busselton Jetty and Geographe Bay from this perfect location situated on half acre of land on the BEACH FRONT. Stroll across the front lawn to the beach, walk to Jetty Observatory, Town Centre, Boutique Brewery. Ideally situated as a base to visit wineries, world class surf, dive on HMAS Swan, caves, tours & fine foods from neighbouring Dunsborough, Yallingup, and Margaret River regions. Main bedroom with queen size bed and ensuite. Bedroom 2 has Queen, Bedroom 3 has 2 singles & Bedroom 4 has 2 singles & a double bunk. Enjoy reverse cycle aircon, fully equip kitchen with microwave, fan forced oven and gas hotplates. Television, DVD, stereo and full laundry facilities. Ample parking for cars, boats etc. Really clean and cozy holiday house. We will be back soon! This place was absolutely perfect for us. We had five adults, three young kids and a dog and we all loved it. Plenty of room for everyone, massive yard, literally a stones throw to the beach and walking distance to Busselton foreshore. We needed nothing but our belongings as the house is well equipped with everything. We will definitely be back! Comfortable older style cottage. Well equipped kitchen, comfortable beds. Beautiful view and directly across the road from dog friendly beach. Definitely hope to stay again. This was a great holiday house and it was nice to be so close to the beach. We had a lovely winter beach getaway with our 2 little terrier dogs. The house had everything we needed and the dogs loved chasing tennis balls around in the giant backyard. Everything was easy to organise and made for a lovely relaxing week away. We’ll definitely be back. What a spacious, comfortable and well equipped house! Had everything we needed. Lots of space out the back. Great views from the front. Lovely walking path all along the beach. Fantastic and accommodating owner, Suzie. Have to give it 5 stars! !